So Jacob Tremblay, who we all loved opposite Brie Larson in Room, is somebody we all love and want to see more of. It may not be enough to get his horror film Before I Wake to open in the U.S., but that's okay because audiences would probably prefer he warm our hearts than scare us out of our seats. And he'll have a chance to do just that in Wonder, which looks like it may be the most heart-tugging movie of the year. 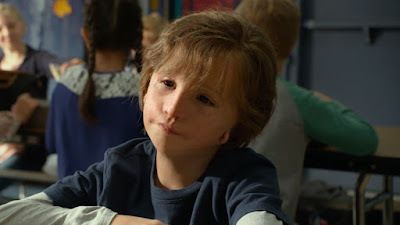 Also starring Julia Roberts and Owen Wilson, the film stars Tremblay as Auggie Pullman, whose facial deformity has kept him isolated from other kids his age. But that all changes when he enrolls in public school and learns that people can be both very kind, and very cruel. The film is based on R.J. Palacio's book and directed by Stephen Chbosky, who navigated complicated social waters with The Perks of Being a Wallflower. Jack Thorne, who recently came aboard to rewrite Star Wars: Episode IX, is also a co-writer. Whatever song they're playing in this trailer is a little too sappy for me, but I guess it makes sense for a film that is pretty transparent in its goals. My hope is that this doesn't turn into this year's Collateral Beauty, a well-meaning film with a great cast that misfires emotionally. Wonder hits theaters on November 17th and co-stars Daveed Diggs and Mandy Patinkin.